The Korat & Thai Cat Association raises money for various charities. The funds are raised through the sale of our merchandise and the knitted cat toys made by some of the committee. This helps with the important work the charities do for the cats. The nominated charity for 2016 was The Stray Cat Rescue in Bedfordshire. 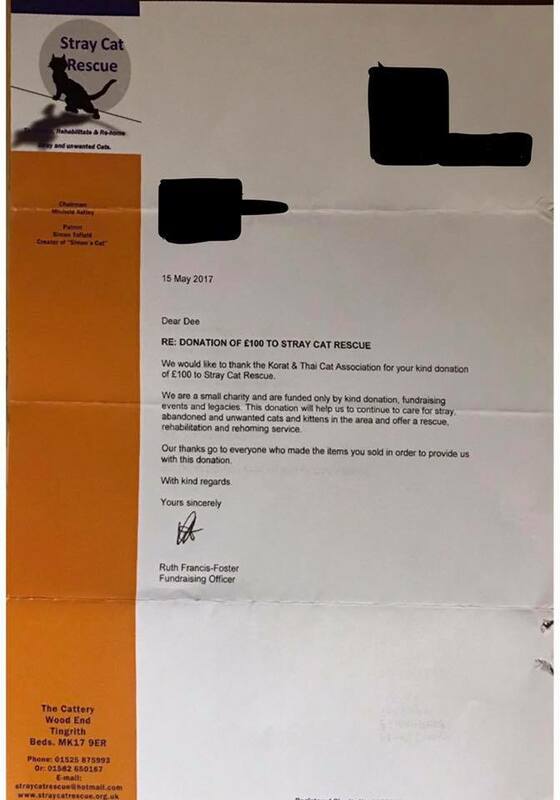 Recently a donation was made to The Stray Cat Rescue and we received a letter from them, stating what a big impact the money will have. You can read the letter by clicking on the link below. Thank you to all who bought merchandise or knitted toys during 2016. The nominated charity for 2017 is The Cat Welfare Trust.